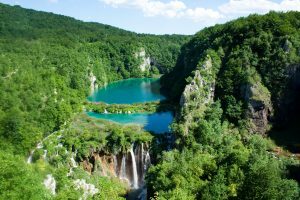 Croatia’s most famous lakes are the Plitvice lakes. 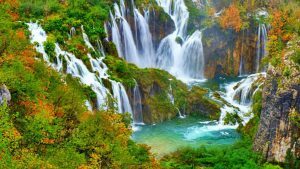 The Plitvice Lakes National Park is one of the oldest and the largest national park in Croatia. In 1979, Plitvice Lakes National Park was added to the UNESCO World Heritage register. The beauty of the National Park lies in its sixteen lakes, inter-connected by a series of waterfalls, and set in deep woodland populated by deer, bears, wolves, boars and rare bird species. The National Park covers a total area of 300 square kilometers, whilst the lakes join together over a distance of eight kilometers. The lakes are renowned for their distinctive colours, ranging from turquoise to mint green, grey or blue. 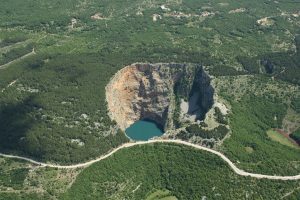 Crveno jezero – Red lake is a sinkhole containing a karst lake near the city of Imotski, Croatia. It is known for its numerous caves and remarkably high cliffs, reaching over 241 meters above normal water level and continuing below the water level. The total explored depth of this sinkhole is approximately 530 meters with a volume of roughly 25–30 million cubic meters, thus it is the third largest sinkhole in the world. Water drains out of the basin through underground waterways that descend below the level of the lake floor. Modro jezero – Blue lake is a karst lake located near Imotski in southern Croatia. Like the nearby Red Lake, it lies in a deep sinkhole possibly formed by the collapse of an enormous underground cave. The total depth from the upper rim is around 220 meters, while water depth varies with season. In spring, when the snow from surrounding mountains melts, it can reach 90 m, and in 1914 it reached 114 m, overflowing the southern rim. The lake is a popular destination for hiking and sight-seeing. 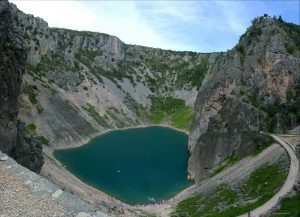 Baćinska jezera – Baćina lakes are located in Dalmatia, Croatia. The lakes are named after the inland town of Baćina close to the port city of Ploče. 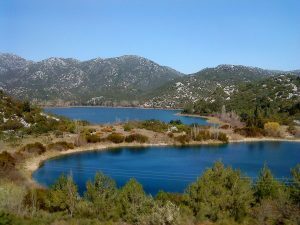 The lakes are part of a picturesque landscape and surrounded by mountains. They are situated between Makarska and Dubrovnik. It is a crypto-depression lake, with its bottom below the surface of the sea. 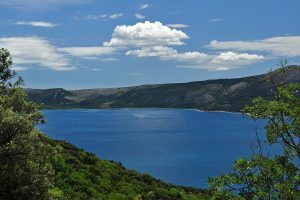 Vransko jezero (Dalmacija) – Lake Vrana in Dalmatia is the largest lake in Croatia. It is a designated nature park (park prirode), a kind of protected area in Croatia. It is located in Zadar County and Šibenik-Knin County, between the towns and municipalities of Benkovac, Pirovac, Pakoštane, Stankovci and Tisno. 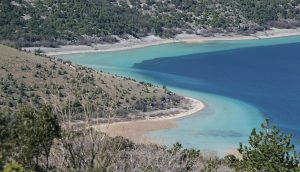 The area of the lake is 30.7 square kilometers (11.9 sq mi), the elevation of its surface above sea level is only 0.1 metres (0.33 ft), while its maximum depth is 4 metres (13 ft). Vransko jezero (Cres) – Lake Vrana in the centre of Cres island, is a fresh water lake, 1.5 km wide and about 4.8 km long. The town of Cres has been supplied with drinking water from the lake since 1953, and the towns of Mali and Veli Lošinj received their supplies ten years later. It was thought at one time that the water in the lake was linked to some mainland source by underground streams, but it has since been established that in fact it originates from the atmosphere.